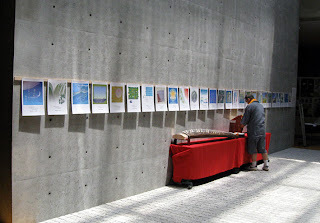 My friends and I met at Chikatsu Asuka Museum this morning, and began setting up the exhibition. 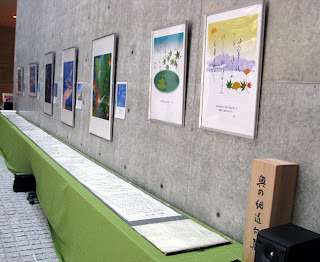 On one wall, the first half(26 out of 52 haiga) of my haiga of Basho's "Narrow Road to the Deep North" is exhibited. Each haiga is small but when placed in this manner, it creats substantial volume. Each haiga is laminated. My friend, a singer, is setting up exhibit of musical instruments on the red table. These instruments were used for the recording of the reading of the Basho's story. On another wall are one haiga from Saigyo's waka, and Basho's famous old pond haiga. The other large artworks are example of my artworks born from some haiga of the Narrow Road series. On the green table is a portion of a 15m (about 45 ft long) scroll, in which you can enjoy the collaboration of calligraphy and my water color painting. My friend's recording will be run as BGM.